Olaf and Wipawee are special missionaries: they are the first deaf members of Wycliffe Germany. Olaf is from Germany. His mother tongue is German sign language. Wipawee is from Thailand. Her main language is Thai sign language—which is quite different from German sign language. They communicate with each other using American sign language! Last year they joined Wycliffe Germany, and they are now developing a team of partners who can support them in their work. They’ve been using our software to help them stay organized, but along the way they ran into a technical issue. To get help they contacted Elke Meier, a local Wycliffe colleague who trains and consults missionaries in how to raise their support along with the use our software. Olaf and Wipawee plan to work as missionaries in Thailand. 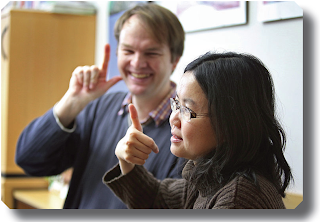 Their goal is to translate the Bible into Thai sign language. How special that in a few years 600,000 deaf Thai people will also be able to have this experience that God is not speechless for them anymore, but that they will be able to share His thoughts in depth. We are so grateful to each and every one of you who have faithfully helped us to make ministry like this possible.